Harrison’s Bird Foods’ Appearance may change from bag to bag. Why Doesn’t The Food Always Look Exactly The Same? My bird wastes his food! Letting Your Parrot Choose its Own Diet? 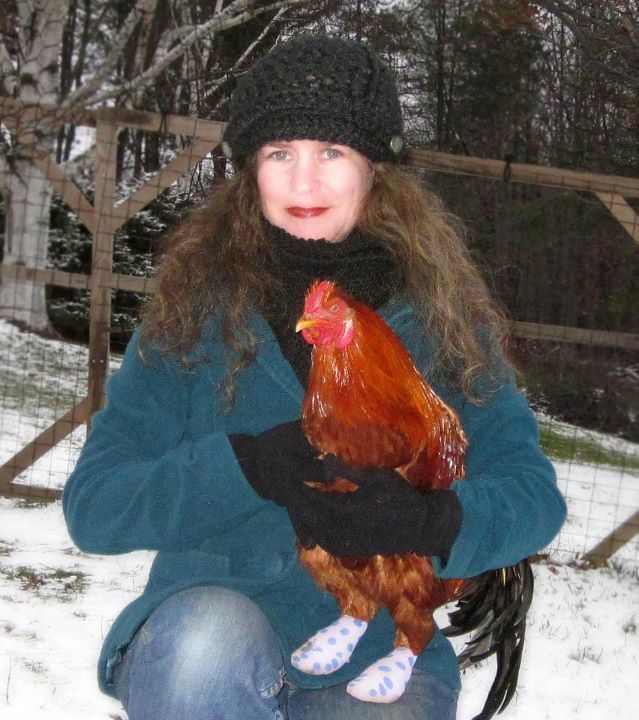 “My bird is my child…” and other similar comments are repeated time and time again in pet bird circles and for dedicated bird owners this really is the case. So considering that your bird is your “child” would you then allow him or her free-choice in selecting their own diet? It’s a nonsensical scenario for a child and it is the same for a pet bird. Birds need the responsible, guiding hand of their “parent” just as a child would along with the understanding that a bounty of “stuff” fed to a pet bird based merely on what the bird likes to eat is not doing the bird any favors. What child wouldn’t deny Grape-nuts or spinach if they had access to a bounty of candy bars and pizza all day long? Unfortunately, the signs of typical bird on a poor free-choice diet are not quite as blatant as an obese child with chocolate all over his face. Often there are no signs, but as time goes on they will assuredly manifest themselves in more subtle ways like poor feather and beak quality. Beaks should not have to be trimmed and feathers should not be discolored, muted or frayed. The bird should not have dander or peeling feet. Molts should be seasonal and thorough. A bird that cannot complete a molt or only achieves partial molts most assuredly needs help in the diet department. Often birds seem to get “stuck” in an ongoing molt. This is dietary. Harrison’s is essentially a line of premium, certified organic “health” foods for pet birds and has decades of tried and true results when fed in a manner as suggested via feeding directions on the back of every bag. This means discontinuing the smorgasboard of “stuff” and providing a stricter, loving supportive hand. Your bird will thank you for this with a long, healthy life with fewer illnesses and emergency visits to the vet. While acceptance of Harrison’s by most birds is typical, certain birds (especially those with bounty of “stuff” to eat) will be picky and hesitant to eat nutritious formulated diets know that ANY bird can and will eat Harrison’s so long as the owner is committed to the bird’s dietary health. We offer a number of online tips and we have a live, friendly staff available during business hours (toll-free: 800-346-0269) should you have any questions about your bird’s diet. Harrison’s recommends any diet change be preceeded and overseen by your avian veterinarian. Thesis submitted in accordance with the requirements of the Royal College of Veterinary Surgeons for the diploma of fellowship by Michael David Stanford. 2 page Avian Companion series brochure detailing causes and support/tips for feather picking parrots. Harrison’s Bird Foods are certified organic by third party certifiers and carry the official seal of the USDA’s National Organic Program. The U.S. Department of Agriculture has put in place a set of national standards that food labeled “organic” must meet, whether it is grown in the United States or imported from other countries. After October 21, 2002, when you buy food labeled “organic,” you can be sure that it was produced using the highest organic production and handling standards in the world. Organic agriculture is an ecological production management system that promotes and enhances biodiversity, biological cycles and soil biological activity. It is based on minimal use of off-farm inputs and on management practices that restore, maintain and enhance ecological harmony. “Organic” is a labeling term that denotes products produced under the authority of the Organic Foods Production Act. The principal guidelines for organic production are to use materials and practices that enhance the ecological balance of natural systems and that integrate the parts of the farming system into an ecological whole..
Organic food handlers, processors and retailers adhere to standards that maintain the integrity of organic agricultural products. The primary goal of organic agriculture is to optimize the health and productivity of interdependent communities of soil life, plants, animals, people and the environment in general. Organic food is produced by farmers who emphasize the use of renewable resources and the conservation of soil and water to enhance environmental quality for future generations. Organic food is produced without using most conventional pesticides; fertilizers made with synthetic ingredients or sewage sludge; bioengineering (GMO); or ionizing radiation. Before a product can be labeled “organic,” a government-approved certifier inspects the farm where the food is grown to make sure the farmer is following all the rules necessary to meet USDA organic standards. Companies that handle or process organic food before it gets to your local supermarket or restaurant must be certified too. What does “certified organic” mean? “Certified organic” means that a non-profit, state or private certification organization, accredited by the United States Department Of Agriculture (USDA), has verified that products labeled as “organic” meet strictly defined organic standards. What is the National Organic Program (NOP)? How can I tell organically produced products from conventionally produced items? You must look at package labels. Along with the national organic standards, USDA developed strict labeling rules to help consumers know the exact organic content of the food they buy. The USDA Organic seal also tells you that a product is at least 95 percent organic. Products containing GMOs (Genetically Modified Organisims) genetically engineered crops etc. can not be certified organic. No. Natural and organic are not interchangeable. Other truthful claims, such as free-range, hormone-free, and natural, can still appear on food labels. However, don’t confuse these terms with “organic.” Only food labeled “organic” has been certified as meeting USDA organic standards. Harrison’s, pet birds and organics? Parrots are well known to be especially sensitive to environmental toxins, such as certain metals, chemical cleaners, and overheated plastic-coated cookware. Chemicals that normally are only irritating to humans and other animals can be extremely toxic to parrots. Yet little thought is given to the potential cancers, neurological problems, hormonal imbalances, allergies and disruptions of their fragile immune systems that may be attributed directly to pesticide residues on foods that parrots ingest or to the inherent dangers of commonly used pet food preservatives such as Ethoxyquin. The EWG (Environmental Working Group) concluded that more than half of the total dietary risk from pesticides was concentrated in just 12 foods from the produce section of the supermarket: strawberries, bell peppers, spinach, cherries, peaches, cantaloupe, celery, apples, apricots, green beans, grapes and cucumbers. Organic is the answer. The use of the USDA Organic seal on Harrison’s products designates that third party organic certifiers, accredited by The USDA have confirmed that Harrison ‘s Bird Foods meets the guidelines specified in The National Organic Program. This is the same USDA Organic seal that you will find on certified organic products sold at your local grocery store or natural foods market. Harrison ‘s Bird Foods are made from crops grown under strict organic specifications. The formulas are created, packaged and stored (at the HBDdistribution facility) under these strict specifications. Conventional farming techniques have incorporated chemical pesticides for many years. In the beginning it was believed that these pesticides were the only way to maintain high crop yields. Not much thought was given early on to the cumulative dangers of these poisons as they were continuously being fed into the earth. Pesticides can cause serious environmental problems. Many pesticides are highly toxic to aquatic life. Pesticide pollution can be driven by rainfall, with contamination of rivers and groundwater occurring from water draining off land or infiltrating to the water table. We are concerned about pesticide residues in water and the effects of pesticides on wildlife. The increased use of pesticides is one aspect of a general intensification of agriculture over the past fifty years. As a consequence of the increased use of pesticides, the number of farmland birds has declined. Evidence suggests that certain pesticides that find their way into water can interfere with endocrine (hormone) systems, for example affecting fertility and reproduction in fish, and leading to developmental changes. The US Migratory Bird Copuncil estimates that of the roughly 672 million wild birds exposed annually to pesticides on U.S. agricultural lands, 10% or 67 million are killed. Organic farming, or sustainable agriculture, is the first step toward moving away from this dangerous trend. Proper crop rotation breaks the cycles of pest and disease problems and balances the nutrient demands of specific crops. Alternative pest controls, such as certain insects or plantings, are incorporated into agriculture. The result is a safe, fertile and biologically diverse ground soil without the dangers of pesticide runoff. For more detailed information on the USDA organic standards, visit http://www.ams.usda.gov/nop call the National Organic Program at 202-720-3252, or write USDA-AMS-TM-NOP, Room 4008 S. Bldg., Ag Stop 0268, 1400 Independence, SW, Washington, DC 20250. What Is the Most Common Ailment in Pet Birds? Improper diets lead to malnutrition. Rejuvenation and new health seen on Harrison’s. Amazing results seen by breeders. Wild Parrots on Harrison’s. Are Seeds a Balanced Diet? Why seeds just don’t work. Harrison’s is made from the very best stuff. Switching to Harrison’s is easy. The contest involves photographic documentation of an animal case in which one of the Harrisons’ Pet Products (AVIx, HEALx or Harrison’s Bird Foods) was used alone or in conjunction with other products to successfully resolve a disorder. Each case was rated according to medical relevance, case completeness, photo quality (before, during and after procedure) and overall presentation. Today we highlight one of our most popular supplemental items – Avian Enzyme. Now available in 2 oz. packaging, Avian Enzyme is ideal for any bird with suspected digestion concerns. If your bird is passing undigested food, not adding enough weight or simply doesn’t appear to benefit as it should from a good diet Avian Enzyme may help. Avian Enzyme is added to your bird’s food and eases the assimilation of nutrients and overall digestion of foods. 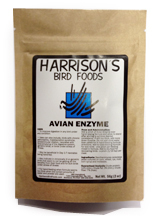 Avian Enzyme is ideal for use with Harrison’s formulas. A source of live, naturally occurring enzymes for birds. – To improve digestion in any bird under any condition. – Uses can also include, birds with chronic pancreatitis, malabsorption syndrome, proventricular dilation, neonates with slow-emptying of the digestive system, geriatric birds, or birds under stress of illness. – May be beneficial in Day 1-7 neonates being hand-fed. – Also indicated in chronically ill or geriatric birds that seem to not be getting all the benefits from their food and for sick birds under stress of illness. – For hand-feeding when formula seems too thick when the correct amounts of water and powder are used. Dose and Administration: Add a pinch of Avian Enzyme over hand-raising formula and allow to stand after stirring to achieve desired consistency. If still too thick, add more Avian Enzyme. Do not add more water than called for in hand-feeding formula directions. Add to tube-feeding formula for sick birds – one pinch per feeding mixed in formula. Add to dry food for recovering birds – a pinch (1/16 tsp) per meal. Ingredients: Saccharomyces cerevisiae yeast cultured on corn, wheat, rye, malt, corn syrup and molasses. National Bird Day Contest Entries. “January 5th is National Bird Day! This important occasion was established by the international animal protection organization, Born Free USA in conjunction with The Avian Welfare Coalition. Its purpose is to honor the diversity of beautiful bird species world wide, to encourage us all to help preserve the natural places that support birds, and to embrace freedom as the right of all winged creatures. good physical exercise from being locked up. © 2019 Harrison's Bird Foods, all rights reserved.